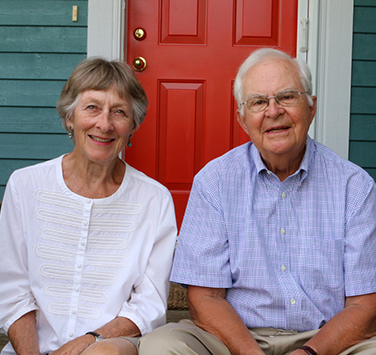 Ted and Joan Cleather moved to Chester in 1994 when Ted retired as Chief Operating Officer at Guardian Trustco in Montreal. Both McGill grads, the couple met in Montreal in the 50’s and went on to live in Toronto and Montreal. They have two grown children and three grandchildren living in the U.S. They are active in their local church choir (Saint Stephen’s) and community choir (the Studio Singers). They have also sung with the Maritime Concert Opera Chorus, touring in Nova Scotia, and with Pierre Perron’s Festival Singers, which took them to Carnegie Hall. “I come from a musical family,” says Ted. “My grandfather was a professor at the Guildhall School of Music in London and he made his living in light opera and musicals in England. My Uncle also had a long career as a pianist during the 30’s and 40’s in London. “We had a piano at home and my parents both played,” says Joan. “I’m grateful that I learned to sing at school. That has been a great help in sight-reading music as an adult chorister. I was a member of the junior choir at church, and at university, I sang with the McGill Chorale Society. For more information on Legacy Giving call Rose Spicer at 902.421.4402 or email sns5@symphonyns.ca.